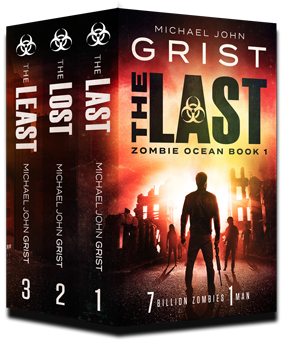 Zombie Ocean Box Set comprises ebooks 1-3 in the Zombie Ocean series, The Last, The Lost and The Least, and tells a zombie apocalypse story with a twist: only one in 10 million people survive. It has over 750 pages (250,000 words) of unique and thrilling post-apocalyptic survival adventure. ‘Robinson Crusoe’ meets the zombie apocalypse like you’ve never seen it before, bringing a mind-blowing twist to all the adventure, blood and gore. 7 billions zombies. 1 little girl. When the zombie apocalypse claims America, only 1 in 10 million survive. Anna is one of them. She’s a sweet 5-year-old girl who hasn’t left her sickbed for a year. She likes banana milkshakes and Alice in Wonderland. She’s alone in a world of 7 billion zombies. ‘Alice in Wonderland’ meets the zombie apocalypse like you’ve never seen it before, bringing a haunting emotional weight to all the adventure, twists and gore. ‘Born on the 4th of July’ meets the zombie apocalypse like you’ve never seen it before, bringing heart-rending heroism to all the adventure, twists and gore. Measure yourself against Amo, Anna and Robert- get all three books now. If you like ‘I Am Legend’, ‘The Martian’ or ‘The Walking Dead’ you will love the Zombie Ocean series. The Zombie Ocean Box Set is available in e-book format for $5.99. I thought the first book was a little Long and drawn out but it definitely set the stage for books 2 & 3. I think the author caught their notch with 2 & 3. I liked the way book 3 ended. It left it where you could be finished with the story but it’s left open for continuation. I hope there’s another book forthcoming in the series. I would like to know how it turns out.